need to care about it? As a picture thinker (Dyslexic) you may think that it is all about reading, writing and numbers. But that is a very very very small piece of the puzzle. Dyslexia makes your brain think in pictures. So everything you do from reading an analogue clock through to trying to put tasks in sequence can throw up its own challenges. We are not going to bore you with words. So take a moment and check out our podcast, see the videos we are slowly... producing and take the test to give yourself some insight into your own Dyslexic traits. This easy to read guide will have you saying 'Aha' and 'That's me' if you are Dyslexic. If you like it make sure you pass it on! Dyslexia – So much more than trouble with words! The word dyslexia comes from two Greek words: dys (meaning bad, abnormal or difficult) and lexis (meaning word). “A developmental disorder which can cause learning difficulty in one or more areas of reading, writing, and numeracy. Nontechnical name: word blindness”. This is a negative definition, referring only to the reading, writing and numeracy aspects of dyslexia. 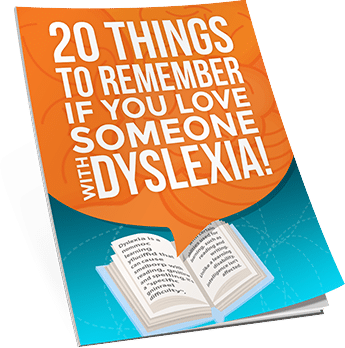 This article will highlight what dyslexia is, and why it affects the way dyslexic’s view the world, process information, build their identity and learn life lessons. Our knowledge about dyslexia is fairly recent. The term was introduced in the 1960’s to describe students with reading and literacy difficulties when there was no other apparent physical reason. The New Zealand government only officially recognised dyslexia only April 2007! There is still much to learn about this neurological condition. Until the advent of MRI scans, we could only study dyslexia by examining the brain of people known to be dyslexic after their death. Often called a learning disability or a defect, dyslexia is thought to only affect reading, words and numbers. We live in a society that generally measures people’s intelligence by their literacy. These factors can lead dyslexics to have very negative school experiences, and subsequently suffer from self-belief and self-confidence issues. School compares students to each other and to the standard of society. When we do not meet expectations, we become painfully aware of ourselves. We start believing we are not good enough and we cannot do things. It is very difficult for a dyslexic to watch others achieving tasks easily and not being able to do the same themselves, no matter how hard they try. This creates, stress, anxiety and feelings of worthlessness. This question has not been answered categorically. **MRI scans show that dyslexics use a different part of their brain to process words when reading. It is commonly accepted that dyslexics are visual learners, or kinaesthetic (hands on) learners. Using the visual processing part of your brain affects much more than just reading. Visual thinkers/dyslexics need pictures to be able to understand concepts. 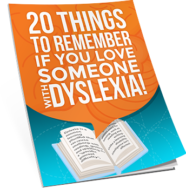 Dyslexics find it hard to understand or remember words, instructions, sequences or numbers. However visual thinking can actually be very effective. Ikea and Lego use pictures on ALL their instructions. It would take a huge amount of words to describe which way the pieces should go and how you should attach them. Instead pictures explain it easily and quickly. Very fast thinking - “A picture says 1,000 words.” Is so truet! If you are dyslexic, you think incredibly fast. You may not even see the image/s and end up stumbling over your words, unfinished sentences, or incoherent speech, as you try to capture and explain the images that are rapidly firing in your head. Time can seem slow for a visual thinker. Their internal thoughts are firing at 32 images per second while word thought is only 5 words per second. Ability to view mental images from any perspective – Imagine an apple. Dyslexics can easily move that image around in their head, and view the apple from the top, side or underneath. Thanks to this ability, many dyslexics establish professions in building, engineering, architecture, design and art. 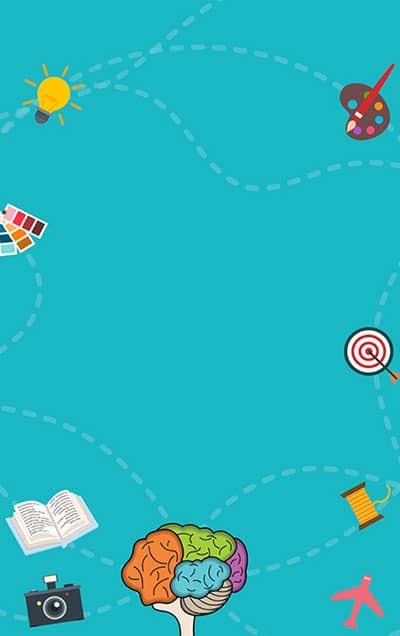 Visual thinking allows you to make connections that are not immediately obvious. Dyslexics do not naturally think in a linear sequence. Their thoughts grow organically and exponentially. This is a great talent for problem solving or creating, but it could be a real handicap when having to organise time, prioritise, manage tasks, or stay focused on one task. How do these talents affect a dyslexic in a negative way? Words, spelling and reading are all sequential tasks. The alphabet starts at A and finished at Z. You read a word from left to right. Maths problems follow a certain order. Dyslexics naturally do not think in a sequence. Do you think about breathing? No, you just breathe. It is the same with visual thought. Dyslexics are not consciously thinking about their pictures, they do so naturally. Words that do not have a picture or do not exist in the real world are another side to literacy difficulties. A dolphin, a cup, a tree, all these words are things that exist and have a form. However, it, the, as, are words that have no picture. They do not exist in the real world. If there is no picture, a dyslexic cannot understand or make sense of the word. The term blindness comes from this. They cannot see words in their mind that are not associated with pictures. Challenges with reading and writing are only a few of the trials caused by dyslexia. People learn best through experience, which is the building block of our identity. Toddlers learn not to touch the fire because it is hot, by experiencing the heat. Not because we tell them it is hot. Imagine using your picture thinking talent and experiencing the world differently. When you are doing something you love, time races by. When you are doing something you hate, time drags. Why does it feel like this? The world does not speed up or slow down. Time moves at a constant speed. Yet all humans can relate to this analogy. Dyslexics often experience this. Part of the visual thinking talent is to be able to see the pictures in your head and use them as the basis for your experience and reality. In your imagination, time can go super fast, or super slow. A picture thinker can easily visualise a treehouse, the pictures are so real you feel like you have been in the tree house, and climbed the tree to get to the tree house. These pictures now become a memory (albeit it a false one). If someone asks if you have been in a tree house, you recall this visualisation/memory as the correct experience and draw from that. However, using false experiences to recall information or make decisions, judge or learn from, could lead to problems. No one likes to get things wrong, or to feel lost. When you cannot trust your own thoughts, you end up in a very uncertain place. Was I really told those instructions? Why I cannot I remember the paragraph I just read? I am sure I put my keys on the table this morning. If you were using your visual pictures, your perception may not be accurate. This constant uncertainty leads to anxiety and self doubt. Dyslexics create real memories from picture thoughts. Telling them their memory is incorrect would create anxiety, confusion and stress leading them to feel inadequate and different. One of the goals of Truth About Dyslexia is to bring awareness to the hidden side of being dyslexic. We want to help talk about, explain and explore the uncertainty and anxiety that dyslexics can experience. There is much more to dyslexia than just a reading, writing and spelling difficulty. Once you understand the challenges, then you can learn to accept and celebrate the dyslexic talents. Take the Dyslexia Quiz designed for adult dyslexics here.